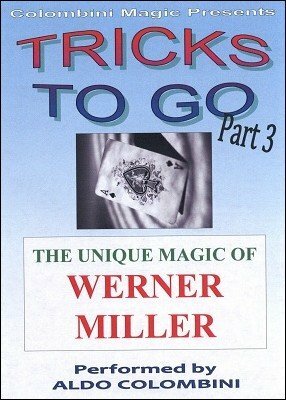 Here is a selection of tricks created by Werner Miller from his ebooks. These are all tricks that can be considered more or less self-working. THE FRENCH CARD TRAP: Here is a non-sleight-of-hand method of locating up to twelve selected cards. 4TUITOUS: A principle that can be used as a simple prediction in its own right, or as a number force in another effect. AS EASY AS COUNTING: A freely selected card is revealed in a very humorous way. HALVES: Unique coincidences using cards cut in half. Great with jumbo cards as well. APART-TOGETHER: This brilliant routine uses the 12 face cards only (Kings, Queens and Jacks). DOUBLE SANDWICH: A production of four-of-a-kind combined with the location of a selected card. 4-3-2-1: The four Kings and the four Aces are shuffled but a spectator can sort them out and separate them in two groups. RIGHT HERE: One of Werner's favorite card routines. And this says a lot. WITHOUT CUPID'S HELP: Pairing lovers is a wonderful job. Your female audience will be delighted to help Cupid.